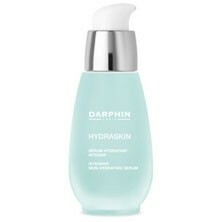 Ideal for all skin types experiencing lack of hydration, HYDRASKIN formulas quench and relieve parched, tight-feeling skin by replenishing and protecting vital moisture preserves. Water-veil and infusing serum instantly delivers hydration to all thirsty skin. Serum concentrate with hydration complex, incorporating Pomegranate, penetrates onto the skin to help deliver hydration to skin. Renewed comfort feeling and supple look. 93% of the total ingredients from natural origin. Formulated without parabens. Non-comedogenic. Dermatologist tested. Non-sticky and provides a smooth base for make-up application. A light, fresh fragrance. Absorbs well. Non-sticky. Very refreshing. Soothes, softens and instantly brightens the skin. Non-irritating. Very expensive. Thinner than many serums so it's easy to use too much. Doesn't have the firming effect that some serums provide. A light, non-sticky serum that softens and brightens the skin. Suitable for sensitive skin. "Non-sticky and provides a smooth base for make-up application."